Look back over production bikes of the last few years and it's hard to ignore the fact that exhaust pipes are gradually getting bigger and bulkier as manufacturers struggle to confirm to ever-tightening emissions regs. While pre-Millennium bikes were happy to have big, round-section exhaust silencers slung like mortar tubes along their sides, the 2000s brought a new trend for largely hidden pipes, with silencers and catalytic converters packed tightly into bellypans to leave little more than a. stub visible. But now that's not enough for most, and with Euro 4 emissions laws in full effect by the start of 2017 new bikes are likely to need large end cans as well as under-engine resonators and catalytic converters. Manufacturers are facing a double-whammy, with all their production bikes required to meet Euro 5 regulations by January 1, 2021 - and that challenge is likely to spawn a rash of more radical gas-flow solutions - like this. Honda are well-advanced with ideas that could see your bike's swingarm doubling as an exhaust - avoiding adding too much extra bulk to the bike. 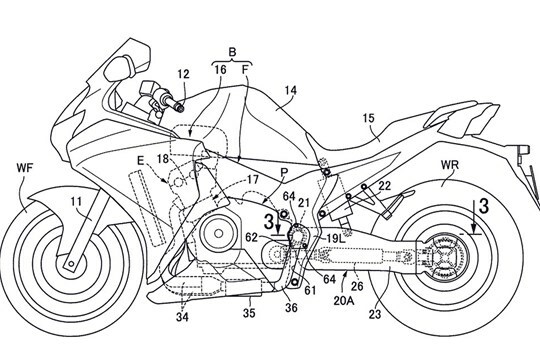 A recently patented design shows a shaft-drive machine, using the silhouette of the VFR1200F, with a drive shaft in the left hand side of the swingarm and silencer in the right. The idea is to route the exhaust gasses into a hollow swingarm pivot spindle, with a sliding seal allowing the exhaust to go from there into the swingarm itself, allowing the usually-hollow structure to double as a silencer. Honda are not the first to think of this. Earlier this year BMW patented a similar idea, using the S1000RR as its basis, where a conventional, stubby-looking side exhaust is connected to the hollow swingarm via a hidden, flexible pipe. 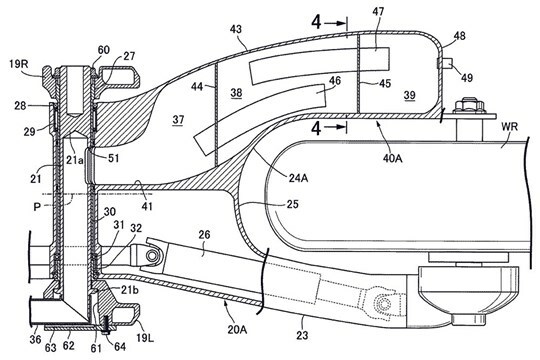 While the BMW idea does not rely on the gas being routed through the arm and out of the other end, it uses the empty space inside the swingarm as a resonator to reduce noise levels. Earlier still, Erik Buell - who's previously put bikes into production with fuel tanks in their frames and oil tanks in their swingarms - also considered using the swingarm as a silencer, and filed patents showing how such a bike would look back in 2009. For aesthetic rather than emissions purposes, Confederate also used to route the exhaust through the swingarm of some of its older Hellcat models.